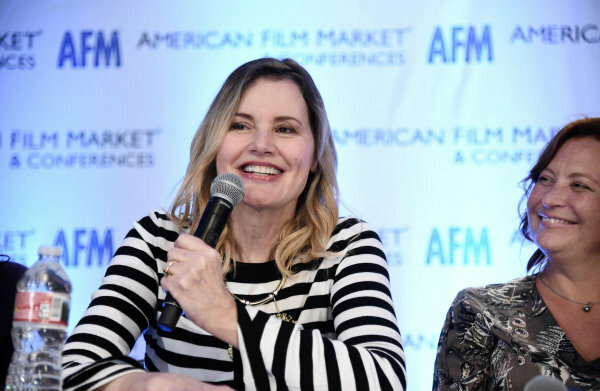 AFM’s “The Future Is Female” (from left) moderator Wendy Calhoun along with panelists Geena Davis, Jen McGowan, Catherine Hand and Jim Whitaker. Known for drumming up business, the recently concluded American Film Market & Conferences also generated food for thought, particularly during an AFM session presented in partnership with the Alliance of Women Directors. Titled “The Future Is Female,” the panel discussion identified problems in the marketplace as well as signs of progress–both of which were touched upon, for example, by Jennifer Warren, chairperson and founder of the Alliance of Women Directors, in her introductory remarks. She added that striving for hiring parity is good business, as proven by FX which instituted a program to get women to direct half of its content. Last year, said Warren, FX attained that 50-50 balance and saw its ratings go up 15 percent. Contending that a woman’s POV offered a fresh perspective to storylines and characters, helping to boost Nielsen numbers, Warren then turned the stage over to discussion moderator Wendy Calhoun, a Writers Guild Award nominee (and producer) for Nashville and Justified, and four panelists: Geena Davis, an Oscar-winning actress (The Accidental Tourist), who founded the Geena Davis Institute on Gender in Media; director Jen McGowan (Kelly & Cal, the upcoming Rust Creek); and Catherine Hand and Jim Whitaker, producers of A Wrinkle in Time, the Disney feature slated for release in March 2018. Based on the novel of the same title by Madeleine L’Engle, A Wrinkle in Time is the first feature with a budget of $100 million-plus to be directed by a woman of color, with that historic achievement being made by Ava DuVernay. A Wrinkle in Time features a cast which includes Oprah Winfrey, Reese Witherspoon, Mindy Kaling and Chris Pine. Feature films also don’t have much to boast of when it comes to casting diversity. According to Davis, “The ratio of male to female characters in film has been exactly the same since 1946.” She noted that most think the percentages have gotten better when there have been certain turning points over the years such as Ridley Scott’s Thelma & Louise, featuring two strong female characters, including Davis’ Oscar-nominated performance as Thelma. “You think that this [breakthroughs like Thelma & Louise] changes everything but nothing has changed,” said Davis. Moderator Calhoun, who’s currently working on a Grey’s Anatomy spinoff, said that re-writing certain characters to be female instead of male in TV and features, can help to address the situation. McGowan has set up Film Powered, a networking and skill sharing tool for female professionals in the industry. It is a free, membership based community of over 1,300 vetted women offering classes, social events and job postings designed to increase the skills and strengthen the contacts of and relationships between its members in an effort towards gender parity in the business. She advised AFM session attendees to check out her filmpowered.com site. Producers Hand and Whitaker discussed A Wrinkle in Time, a film which has been a lifelong dream for Hand whose storied career includes collaborating over the years with iconic TV series creator Norman Lear. It was worth the wait as Hand and Whitaker both said they treasured the experience of working with DuVernay. Hand said that DuVernay make it a point to seek out female and minority talent for her crew. For industry vet Whitaker, DuVernay was the first woman director with whom he’s collaborated. “It’s been an incredible experience,” he assessed–so much so that Whitaker is gearing up for a feature which too will have a female director. He provided some backstory for the pending project which he wasn’t yet at liberty to publicly discuss in full detail. Exhibitor and attendee numbers were up at the overall AFM. In total, 7,415 participants visited the event’s prime venue, the Loews Hotel in Santa Monica, as attendance rose by 6%. The market also saw 1,476 buyers arrive from 71 countries with China and Taiwan each seeing growth of 35% more buyers. Overall exhibitor participation was up 18% with 445 registered exhibiting companies, with the largest number of exhibitors arriving from the United Kingdom, France, South Korea, and China, after the U.S.
AFM Conferences drew an international audience of more than 700 each day listening closely to advice and insights from the likes of Cassian Elwes (Producer/Agent), Jesse Sisgold, (Skydance Media), Adrian Alperovich (OddLot Entertainment), Tobin Armbrust (Virgin Produced), Rebecca Cammarata (Stay Gold Features), Brian O’Shea (The Exchange), Alison Thompson (Cornerstone Films) and Sam Brown (STXfilms). In addition to “The Future Is Female,” AFM Roundtables included sessions on Documentaries, Faith & Family films and LGBTQ representation in cinema. The newly introduced Writer’s Workshop also proved to be a highly popular addition to the AFM experience with instructors from USC and UCLA teaching audiences of 400. The AFM Campus was busier than ever as attendees took in screenings of 337 films (40 more than last year), including 264 market premieres and 61 world premieres. An additional 78 films screened on demand. The American Film Market & Conferences is produced by the Independent Film & Television Alliance. Next “Yikes! I think I’m in over my head.” Or…making your first movie.